Step 1: Click on -> Select -> Click on option in “Custom Lists” window. Step 2: Enter list [Name] and [Description] in the “Create a List” window. “Advance Custom Field” option can be used to store details of list items/ values. By default, < Name> and < Code> of each item is recorded in the system. If you need to add other fields to store details of list, you can add them by using button. Step 1: Click on -> Select -> Click on icon in “Custom Lists” window. Step 2: Edit required details in “Edit a List” window. Step 3: Click on button to save changes. Click on button to exit. Step 2: Click on “Yes” button to confirm the deletion in “Attention” pop-up window or click on “No” to deny the deletion. 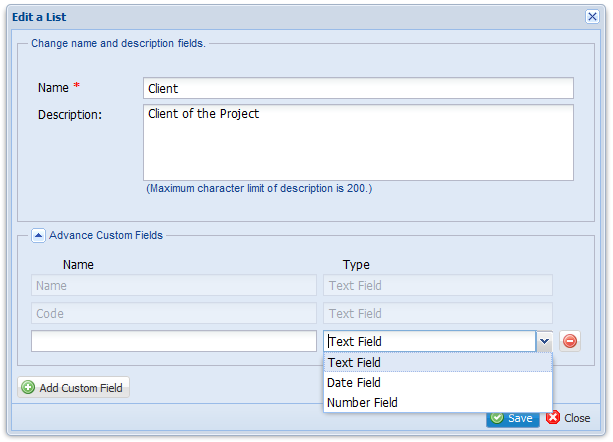 Step 2: Select the custom list you need to add item. Step 3: Click on option. Step 4: Enter new item details in “Add a Item” window. Step 5: Click on to save the item to list and add another new item. If not, click on button to save the item to list and close “Add a Item” window. Step 2: Select the custom list & item you wish to edit. Step 4: Edit item details in “Edit an Item” window. Step 5: Click on button to save the modifications. Step 2: Select the custom list & item you wish to delete. Step 4: Click on “Yes” button to confirm the deletion in “Attention” pop-up box OR click “No” to deny action.